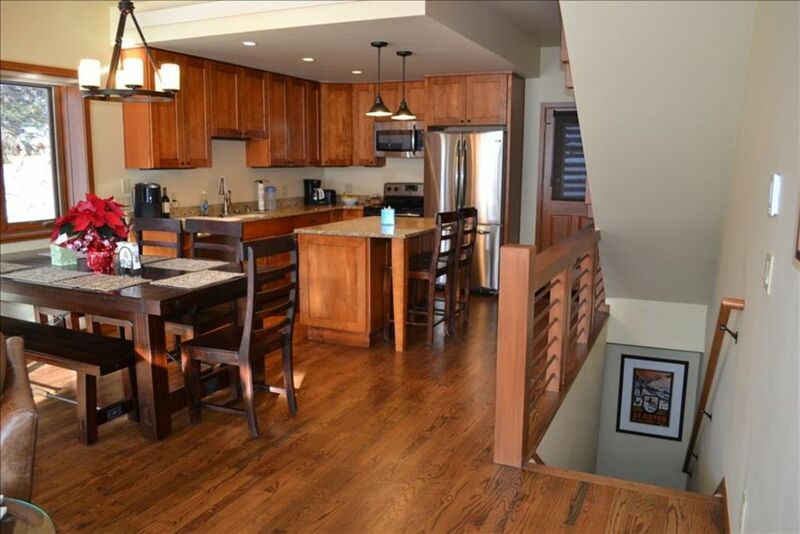 You will absolutely love our completely renovated Copper Condo - featured in the Summit County Parade of Homes! We remodeled the kitchen and main living area, all bedrooms, both full bathrooms, replaced all carpet with hardwoods or new carpet, painted the entire unit, and much more! All of the work was done by award winning Trilogy Partners from Breckenridge. This spacious (1,700 sf) and sunny Beeler Townhouse is one of ten units located just a short walk from the American Flyer & Union Creek lifts as well as the Village at Copper Mountain which contains shops and restaurants. In the summer you are located next to the bike path that runs along Ten-Mile Creek and connects Vail, Copper Mountain, Frisco, Breckenridge, Keystone, and Lake Dillon. The biking options are endless. The Summit Stage bus system gives you easy access from all these other areas back to the Townhouse (except Vail). Our condo is four stories and includes a large direct access one-car garage. The main floor living area leverages its open floor plan, with deluxe new kitchen and appliances, island counter with seating for two, a dinning room table with seating for eight, comfortable leather sofas / chairs which surround a cozy gas fireplace and large screen TV with cable and DVD. There is also a front porch and small back porch. The townhouse's unique design, with three stories of floor to ceiling windows, allows guests to enjoy unobstructed views of the slopes and the mountains along the Ten-Mile Range. There are two enclosed private sundecks on the third and fourth levels that are accessed from the master or main guest bedroom. These decks are perfect for relaxing with a book in our comfortable Adirondack chairs at the end of the day, watching the last skiers come down or watching the bikers head up Vail pass. The third level consists entirely of a huge Master Suite: private enclosed sundeck, spacious bedroom with king-size bed, 47' flat screen TV, large closet, dresser, and bath with double sink vanity and large shower with seating area. The fourth level includes a private guest bedroom with queen-size bed, and private enclosed sundeck with spectacular views of Copper Mountain. The 3rd private bedroom has two bunk beds (4 twins), and a large screen dvd / TV combo - great for children! There is also a new full bath for the fourth level guests. All bedrooms have new flat screen TVs with cable access. There is plenty of storage space for bikes, skis, and other sporting equipment in the direct access garage. A large mudroom is just off the garage, which includes a full-sized washer and dryer and newly added 1/2 bath. Apologies, we do not allow pets or smoking in our home. Book your vacation now! Great place for skiing, winter sports, summer escapes, fishing trips, mountain bike gatherings, family reunions, wedding parties, or sailing regattas on Lake Dillon. * Rates do not include required cleaning fee of $175 per stay. * Cancellation Policy: 95% refundable 90 days prior to stay, 45% refundable 45 days prior to stay, 20% refundable 20 days prior to stay, if the townhouse is rented for a canceled period partial refunds will be made depending on the rental rate and duration. This unit is owned by the Sanders & Matt Miller. Great family ski mountain with easy access, beautiful views, variety of outdoor activities and a convenient location. Walk to the ski slopes and village. Scenic views. Outdoor activities and quiet location. toilet, Sink in the basement mudroom. The Hot Tub is operated during winter months only and shared by the 10 Beeler Townhouse Units. In early 2012, unit was completely updated. Took a 4 night trip to Copper with daughter and another dad/daughter pair. The house was perfect. Kitchen had everything you need. The master was great, the other queen room was great...and the kids (of course) loved having their own room in the bunks. Can walk to Center Village in shoes and West Village in ski boots. Picky things that I really liked. Lots of pillows on each bed, TONS of towels, satellite TV with lots of channels, fast internet, and a bathroom stocked like a hotel. FYI - we also had weather delay our trip and the owners graciously allowed us the come a date late and stay a day longer with no charge at all. We will so happy to be able to make that change! Beautiful house, beautiful views, kitchen and bathrooms are brand new and fabulous. Owner was kind, helpful and attentive. We loved Beeler Place 1! We were two adults and three kids and stayed for 4 nights. The location was close to both Center Village and West Village. We walked to the lifts with a 5 year old. The living area was spacious. The kitchen was well stocked and provisioned. We stored our gear in the garage and did some laundry. I think the dryer sensor may not be working so I did timed dry instead. This is the second year we stayed at one of the Beeler condos and we'll definitely do it again! Our family of seven enjoyed this beautiful condo. Great location. Close to both center and west villages. Garage entrance perfect for storing ski gear. Owners were lovely to work with and were accommodating when we had last minute transportation issues. Will definitely recommend to others and stay here again on our return trip to Copper. Been coming to Copper for 20’years and this condo was outstanding, Great views and sun porches for end of day. Multiple floors gives family of six space. Highly recommend. Two families stayed in this condo together. The space was very well equipped with kitchen dishes and supplies as well as bathroom toiletries and linens. Have the attached garage to store skis and a great mud room to keep ski boots warm over night was a huge plus for us. The beds were comfy and the owner was easily accessible and attentive when we had questions or needs. Note that during High Season - Christmas, New Years, March, and other special occasions we may not accept short term rentals booked more than 30 days out. .